Firebreak also called "fireroad", "fire line" or "fuel break"
A firebreak is a gap in vegetation or other combustible material that acts as a barrier to slow or stop the progress of a bushfire or wildfire. A firebreak may occur naturally where there is a lack of vegetation or "fuel", such as a river, lake or canyon. Firebreaks may also be man-made, and many of these also serve as roads, such as a logging road, four-wheel drive trail, secondary road, or a highway. In the construction of a firebreak, the primary goal is to remove deadwood and undergrowth down to mineral soil. Various methods may be used to accomplish this initially and to maintain this condition. Ideally, the firebreak will be constructed and maintained according to the established practices of sustainable forestry and fire protection engineering also known as best management practices (BMP). The general goals are to maximize the effectiveness of the firebreak at slowing the spread of wildfire, and by using firebreaks of sufficient size and density to hopefully reduce the ultimate size of wildfires. Additional goals are to maintain the ecology of the forest and to reduce the impact of wildfires on air pollution and the global climate, and to balance the costs and benefits of the various projects. These goals can be achieved through the use of appropriate operating practices, many of which can be potentially mutually beneficial to all. In many cases, it may be useful for firebreak upkeep to be used in concert with the harvesting of forestry products such as lumber and biomass fuel, since the objectives are fundamentally related, in that the basic goals are to remove material from the forest. Furthermore, if done properly, the value of these products can significantly offset the cost of maintaining the firebreak. In addition, these commercial industries and small businesses are helped by a reduction in the property damages caused by wildfires, and reduced risk of investment. The biomass material that is not suitable for dimensioned lumber, is suitable to make woodchips for the paper industry, and the energy industry. Larger trees are sometimes left in place within some types of firebreaks, to shade the forest floor and reduce the rate of fuel accumulation, and to enhance the landscaping in recreational and inhabited locations. Forested areas often contain vast networks of firebreaks. Some communities are also using firebreaks as part of their city planning strategy. An example is the City of Revelstoke, British Columbia including Firebreaks in their Community Wildfire Protection Plan. By comparing the burnt (right) and unburnt (left) sides of a dirt road in South Africa after a major veldfire (wild fire) the effectiveness of the road in acting as a firebreak can be seen. Depending on the environmental conditions, and the relative effectiveness of a given firebreak, firebreaks often have to be backed up with other firefighting efforts. Even then, it is still sometimes possible for fire to spread across a seemingly impenetrable divide. During the worst part of the fire season in southern California, strong Santa Ana winds were observed to blow carpets of burning embers across eight-lane freeways. During the 1988 fires in Yellowstone National Park, hot embers managed to cross the Lewis Canyon, a natural canyon up to a mile wide and 600 feet (180 m) deep. In Australia, firebreaks are less effective against eucalyptus forest fires, since intense fires in tinder-dry eucalyptus forest spread through flying embers, which can be carried by the winds to trigger new blazes several kilometres away. The world's most expensive firebreak was created when part of Van Ness Avenue in San Francisco was dynamited to stop the spread of fire resulting from the 1906 San Francisco earthquake. Firefighting after an earthquake can be especially challenging, because an earthquake can cause water mains to rupture, resulting in a complete loss of water pressure. Firebreaks, along with backburning, are also the source of the everyday phrase "fight fire with fire". 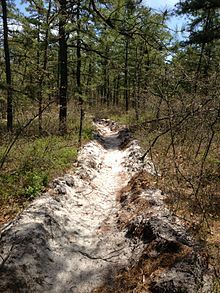 A firebreak was also used as a trail for David Sweat, a prison escapee from the Clinton Correctional Facility in New York, trying to enter Canada in 2015. ^ "Prevention and Protection from Fires » City of Greater Geraldton". www.cgg.wa.gov.au. Retrieved 2018-05-30. ^ Girard, Rob (2018-05-30). "Community Wildfire Protection Plan". City of Revelstoke. Archived from the original on 2018-05-30. Retrieved 25 July 2018. ^ Adam, David (2009-02-09). "Australian wild fires prompt call to return to Aboriginal bush control". The Guardian. Retrieved 2017-02-12. ^ Coleman, Le Vert (1906-05-02). "U.S. Army Dynamite Report - 1906 Earthquake". www.sfmuseum.org. Retrieved 2018-11-10. ^ Martin, Gary (n.d.). "The meaning and origin of the expression: Fight fire with fire". phrases.org.uk. Gary Martin. Retrieved 2017-02-12. ^ Feyerick, Debroah (2015-06-28). "David Sweat shot and captured alive after New York manhunt". CNN. Retrieved 2017-02-12.